Top: An LT image of the super-luminous supernova, PTF12dam. 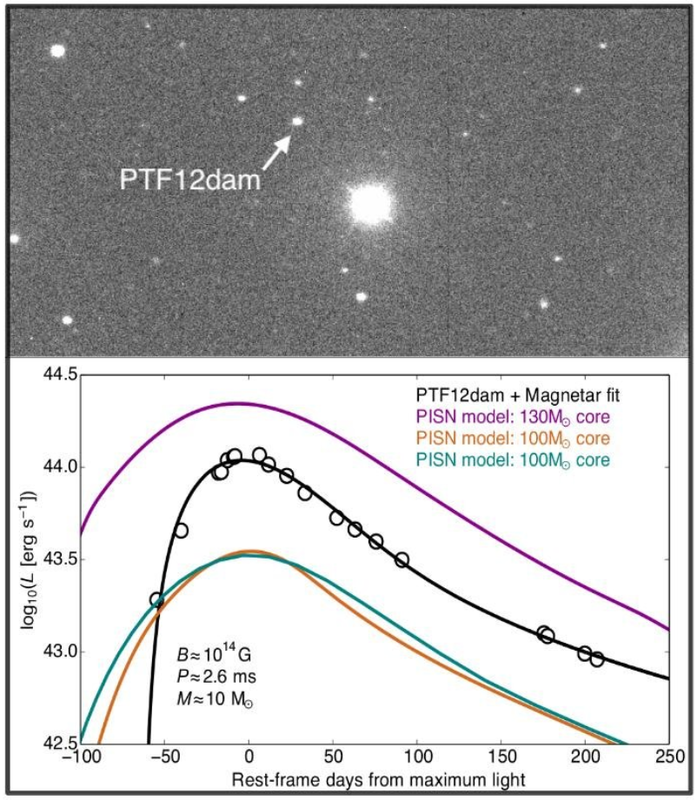 Bottom: A plot showing how the luminosity of PTF12dam varies over time (open circles), compared with models of pair-instability supernovae (PISN) and a magnetar-powered supernova. Astronomers lead by a team from Queen's University Belfast have recently published new observations which help to constrain the power sources driving the brightest explosions in the Universe, known as "super-luminous" supernovae. Their findings have recently been published in a paper lead by Matt Nicholl in the journal Nature*. Super-luminous supernovae are 10-100 times brighter than normal supernovae, but are extremely rare. Scientists have proposed several theories as to why these unusual events emit so much light. One long-standing idea is that these supernovae result from an instability (called a "pair-instability") occurring in the most massive stars, objects over 100 times the mass of our Sun. The instabillity generates huge amounts of radioactive material. Another popular idea is that the additional energy needed to power these supernovae comes from a rapidly rotating, highly magnetic core (a "magnetar"). The more massive the star, the longer it takes for light to escape from the ejected stellar material, resulting in a slower rise to maximum brightness. One particular super-luminous supernovae, PTF12dam, was seen to evolve very slowly. It was therefore a good candidate for a pair-instability supernova. Nicholl and his team monitored this object for over a year, using the Liverpool Telescope and others around the world. 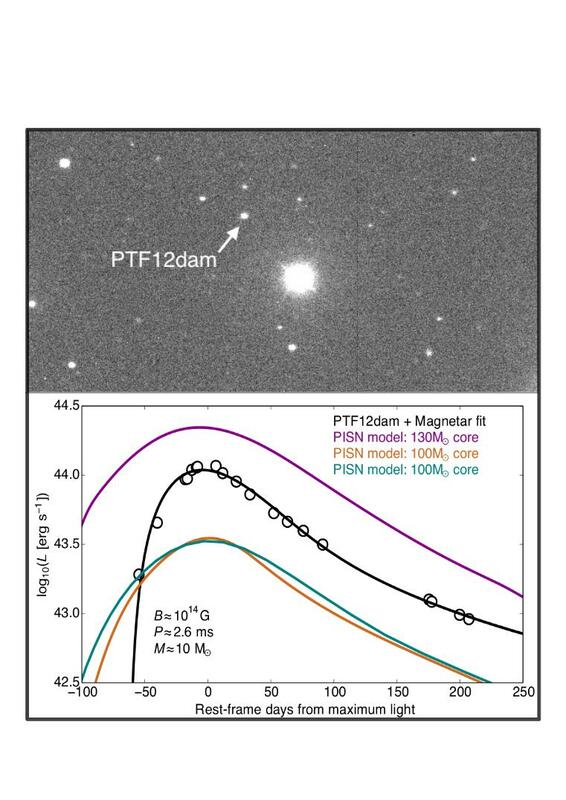 By comparing their data with pair-instability and magnetar models, they found that despite a very slow fade after peak luminosity, PTF12dam brightened too quickly in the early stages to have come from an extremely massive star. However, their analysis showed that a magnetar-powered model could reproduce the observations. The graph shown to the left shows a comparison between the changing luminosity of the target and four models. The three pair-instability models - the three coloured lines - do not fit the data at all well. They clearly take too long to reach peak brightness, presumably because of a large diffusion mass. The magnetar model, however, indicated by the black curve, fits the data well. In this model the magnetar spins with a period of 2.6 milliseconds, possesses a very strong magnetic field (1014 Gauss), and has ejected 10 solar masses of material. The Liverpool Telescope is ideally suited for imaging these rare transients, as frequent observations over many days are needed to show how the luminosity varies with time. These and similar observations will continue to provide major clues to unravelling the mysteries of these fascinating supernovae. * Nicholl M., Smartt S.J., et al. 2014, Slowly fading super-luminous supernovae that are not pair-instability explosions, Nature, 502, 346.